According to Sadhvi Pragya her arrest in the Malegaon blast case was politically motivated to endorse the bogey of saffron terrorism, a term coined by the former Union minister P. Chidambaram. After getting bail from the Bombay High Court in April 2017, Sadhvi Pragya blamed Chidambaram for the putting her behind bars, alleging that she was "falsely implicated in the case to endorse the bogey of saffron terrorism". Soon after the announcement of her candidature from Bhopal, Sadhvi Pragya admitted that she is inexperienced in the politics but ready to take the charge to bring honour to 'saffron', whose image has been tarnished by the opposition party. Alok Sanjar, who has left Bhopal seat for Sadhvi Pragya, agreed that she had been harassed and implicated in a false case, and that now she would take revenge by winning the election. Sadhvi Pragya reportedly revealed that she was brutally tortured in illegal police custody for 23 days continuously during interrogation, and was denied access to her lawyer and family members. 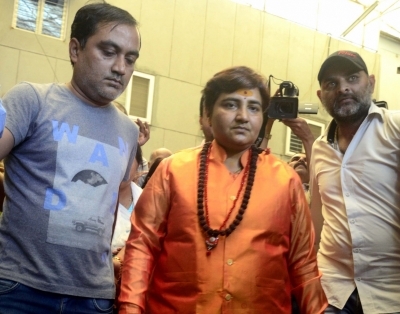 Sadhvi Pragya, who has always remained in the news for making controversial remarks, had been associated with the RSS-linked youth outfit Akhil Bhartiya Vidhyarthi Parishad (ABVP) and the 'Durga Vahini', the women's wing of the Vishwa Hindu Parishad (VHP). Sadhvi Pragya was arrested in October 2008 in the case. Later another prime accused Lieutenant Colonel Prasad Shrikant Purohit was arrested in the case in November that year. Both were charged with plotting the blasts as part of a pro-Hindu group, Abhinav Bharat. In May 2016, National Investigating Agency, which is probing the Malegaon case, dropped stringent Maharashtra Control of Organised Crime Act (MCOCA) charges against her in its chargesheet filed before a local court in Mumbai. The investigating agencies had said earlier that the terror strike was carried out allegedly by the right-wing group, Abhinav Bharat and a total of 11 accused, including Sadhvi and Purohit were arrested. At least seven persons were killed and 80 injured in the blast in Malegaon, a Muslim-dominated powerloom town in Nashik district on September 29, 2008. At the time of her arrest, the Sadhvi was charged for allegedly planning the terror blast and providing a two-wheeler that was used to plant the bomb. Nearly eight years later after the Anti-Terrorism Squad (ATS) presented videos and transcripts purportedly showing Sadhvi as part of conspiracy meetings for the 2008 Malegaon blasts, both the ATS and NIA backtracked before the court. Sadhvi Pragya, who has earlier blamed Congress-led UPA government, has said that she would "fight against those who are conspiring against the nation." She has been booked in former RSS pracharak Sunil Joshi murder case but was acquitted by a Dewas court in Madhya Pradesh in February 2017. Joshi was shot dead a few hundred meters from his rented house in Chuna Khadan area of Dewas on December 29, 2007.